At least two monks from the Benedictine priory at Dunster (near Minehead, Somerset) went on to become abbots of Bath Abbey, of which Dunster was a cell. 15th-century inscriptions on a flyleaf of this manuscript mention John Dunster, and two men of this name were priors of Bath in the early and late 15th centuries. This suggests that the manuscript may come from the library of Bath abbey. The style of the initials 'd' and 'D' is unusual for an English manuscript, but resembles a common Italian style. 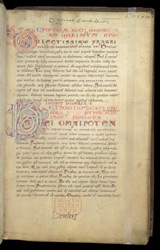 The initials are plain vellum, outlined in red or blue, on a multi-coloured ground of yellow and blue or yellow and red.